Painting in oils and pastels, Dorothy’s large studio paintings and colourful plein air sketches convey her feelings for the outdoors, whether in Canada or abroad. She has studied with prominent artists in Western Canada and the Maritimes, the U.S.A., Scotland, England and France. 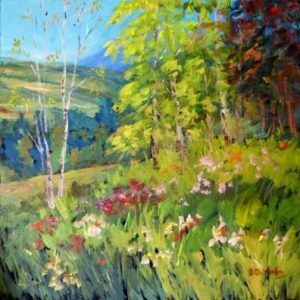 In painting the landscape, she attempts to convey a sense of place in her work and reproduce the beauty of each season. A Scottish born Canadian, she has lived in Calgary since 1970. She is a former director of both the Society of Canadian Artists and the Leighton Art Centre, Calgary, an active member of the Federation of Canadian Artists, Vancouver, a member of the Oil Painters of America, Pastel Artists Canada and the Visual Arts Association of Alberta. She has served as a Juror for the SCA 2012 exhibition at the Halifax Club and the Leighton Art Centre’s 2013 Juried Members’ Exhibition.